I was lucky enough to be able to go and see one of my music icons at the weekend. It’s 35 years or so since I first saw this icon, and it is fairly true to say that that experience changed my life, and certainly my musical outlook. Last night, playing in a lovely venue that I hadn’t been to before, and in front of an audience who behaved impeccably and lapped up the fare placed before them, it was a real lift to me on a weekend when my thoughts have been very negative. My icon played and spoke, sang and laughed; she made mistakes, swore once or twice, but kept going all the while knowing that she had the audience captivated, and the odd error would not be detrimental to the overall evening. Accompanied by a couple of raw guests, the music flowed and swayed, lifted and retreated, while the new guys added what they could (which was actually more than just funny haircuts! ); there were highs from happy songs and even a couple of nods to past friends sadly no longer with us. In fact, the whole evening was something of a celebration of a past friendship with one person who is dead, but with such evenings the memories are always happy ones, and it certainly ended on an upbeat note. Bob Curtis died on Friday, at the age of 60. On Saturday, the Charlton players wore black armbands in memory of Bob; it was a small token for a fine Addick. Sadly, what surrounded that recognition was not so good. Despite Frazer Richardson’s under-hit daisy cutter creeping under the visiting goal-keeper to give Charlton the lead half an hour in, Gillingham levelled 16 seconds later (a great volley by Bircham). Despite Charlton hitting the cross-bar twice in the first half (through Sam Sodje and Deon Burton), the team went into the break losing thanks to Christian Dailly allowing a forward to turn and Rob Elliot having the shot bounce off his chest for Oli to score from the rebound. Despite the effort and energy expended in those first 45 minutes, sections of the crowd showed their collective displeasure as the half time whistle went. At 2-1 down, heads were being held pretty low. The passion was leaking out of The Valley from then on…. 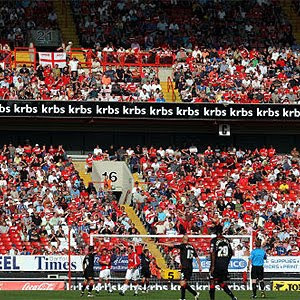 Despite Charlton playing much better in the second half, the crowd became increasingly restless. Despite David Mooney turning and rifling in a great equalizer after an hour, he had to show his displeasure at being boo-ed when his name was announced on the team-sheet by running toward those very same boo boys cupping his ear to hear their cheers (not jeers). Despite having a decent game, Therry Racon threw a tantrum and started to smash up the dug out when he was substituted, thereby showing he was selfish in the extreme and that the game was all about him and not the team, our team, Charlton. Despite plenty of pressure, the winning goal would not come and there were more cat-calls as the final whistle went. Despite all of this, and the season we are having, the manager Phil Parkinson chose to highlight the jeering in the light of how good a job he had done with little to work from. Parky, take a look at what Lennie Lawrence did; what Alan Curbishley did – they had no money and had to rely on loan and free signings much of the time; it’s what being a true Charlton manager is all about and you are no different. When Andy Nelson lost the crowd, he was well down the road to losing his job; you would do well to remember that. Despite being third in the league, it is very obvious that things are not well. Too many injuries, too many people out to look after themselves rather than the team; too much selfishness, and that includes from the crowd who may well only worry about what workmates say when Charlton fail to win yet another game against supposedly inferior rivals. League football is not a game; managing a club is not as easy as playing Championship Manager! There are real lives and real people at stake, along with real supporters. We would all do well to remember that. Look back in the history books - our club has done well when the chips were down; we need to fight for everything we want because nobody will give us anything for free. Life is like that! You need to have a passion if you want to work for Charlton, or play for Charlton, or manage Charlton. You also need to have a passion if you are to be an Addicks supporter. That passion is missing. It is missing from the management, the players, and from some fans. We have players who are good enough, but they need to show it. We can live with mistakes; we can accept the odd-swear word borne out of frustration; we have to keep going, keep playing, keep trying. New players have to settle in, and be allowed to settle; they will benefit from a good atmosphere a lot more than from a bad one. We must accept mistakes for what they are – mistakes, just mistakes. Nobody makes them on purpose, and if they are passed by quickly and forgotten, then the team can move on and not worry about making more. We shouldn’t worry about making more because the opposition will make lots too! What do you think the Gills fans thought about the first goal conceded? Did they bait their ‘keeper for the rest of the game? No. If we can regain our lost confidence then we can move forwards once more. I used to be proud of Charlton in the 1990’s; not because we beat other teams but because we were always moving forwards as a club – up the league a little, increasing the stadium capacity; getting the finances right; building for the future. We have stopped that progression. It doesn’t have to always come on the pitch, and it doesn’t always have to be shown off it, but as a club, we must always be moving forwards. We all need to have a passion about ensuring that. When it returns, we will sing, and laugh, and smile and joke. Patti Smith is 62, and she has passion. Bob Curtis died on Friday, at the age of 60; he had a passion. Sadly my own passion for writing this blog is diminishing. Until the passion returns to the club, I will bide my leave. Well if that is the last post Pedro and I hope it is not, that was a very rousing post. Very much understand your feelings Pedro. I'd raced up to the game on Saturday with my 9 year old son - I'd been "managing" his team, and thanks to the previous game overunning we were very late. We went to get a burger for our lunch at the end of half time - and happily missed the first 10 minutes of the second half. We were well hacked off and I said we didn't have to go to the MK Dons away game if he didn't want to. "No Dad, this is Charlton for you - we'll go" was his response. I couldn't quite believe my own indifference - but if he can still want to follow them after seeing nothing but tragedy for most his football following life then I certainly can. I hope you will reconsider - I've enjoyed reading your blog, and like the other bloggers, I treat you with a certain legendary status! Cheers mate - look forward to reading you again soon. I hope this is not pedro's last blog. As a charlton exile your comments and match reports are amongst my fav. reading. Don't dispaire my friend we are Charlton supporters and expect adversity. I sympathise Pedro, as I guess we all do. I hope you will post again soon and hopefully to celebrate some Addicks success. Let's pray it's not too long ! Please don't abandon the blog! I can certainly empathise with your feelings, but hope that you will carry on blogging.